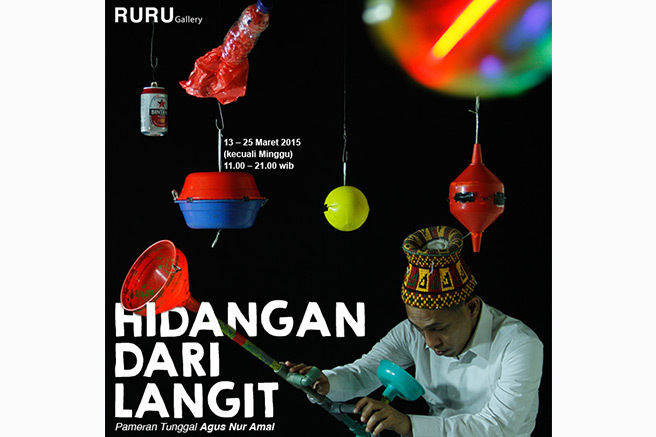 This year, Agus Nur Amal has entered his 25th year of working in the world of art and culture in Indonesia. Agus, who also known as PM Toh, has been doing stage performances locally and abroad as a solo performer. His various tale mostly related to Indonesian social and political phenomenon. In this exhibition entitled “Dishes from the Sky”, he conducts a visual exploration of daily objects by displaying a series of universe-themed photographs. The title selection and photography as a medium is more than an exploration, it is also his attempt to re-interact with his stage properties. Agus is personally interested in the idea of science and nature that he found in the verses of the Holy Koran, which he later collected and translated into a visual form through the representation of the objects. For him, the verses of the Holy Koran are ‘dishes’ provided by God to educate mankind and for us to understand His greatness. The most fundamental thing that we can find in this exhibition may be formulated in the question he once raised, “Will these objects still be able to make a ‘sound’ or ‘speak loud’ like they were used as props on stage?” For him, this exhibition is the experimentation to alter the association on our observations of the universe through objects from our daily life.ciation over the observations about the universe through objects that are always floating around in everyday life.